Dr. John Teichgraeber earned his medical degree and completed his residency at the Emory University School of Medicine in Atlanta, Georgia. He also completed a fellowship at the University of Texas Health Science Center at Houston (UTHealth) Medical School. Board certified in both otolaryngology and plastic surgery, Dr. Teichgraeber’s major clinical interests are cleft lip and craniofacial surgery. 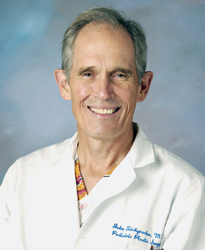 He has practiced in Houston since 1986, treating patients from birth to adulthood. Dr. Teichgraeber focuses on accessibility and family-friendly care. He is part of a group of pediatric surgery specialists who utilize a team approach to the care of congenital deformities. A resident of Houston, Dr. Teichgraeber is married and the father of two daughters. Outside his practice, he enjoys cooking, golf and swimming. Pediatric surgeons have the ability to bring smiles to patients and their families. Dr. John Teichgraeber, director of the Division of Plastic and Reconstructive Surgery in the Department of Pediatric Surgery, recently brought smiles and positive outcomes to patients in Mexico as part of a medical mission trip. Daniella Coca’s son Anthony was born last November with both a cleft lip and palate. Coca was five months pregnant when she received the diagnosis after a 3-D ultrasound, which afforded her and Anthony’s father several months to meet John Teichgraeber, M.D., and his team.